Click here to see the list of teams. Click here to see the full battle schedules. 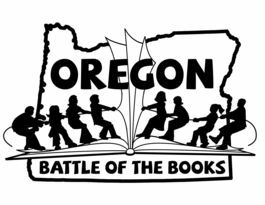 The Oregon Battle of the Books, OBOB, is a statewide voluntary reading motivation and comprehension program sponsored by the Oregon Association of School Libraries in conjunction with a Library Services and Technology Act grant. Students in 3rd-12th grade, regardless of ability, are exposed to quality literature representing a variety of literary styles and viewpoints. The mission is to encourage and recognize students who enjoy reading, to broaden reading interests, increase reading comprehension, promote academic excellence, and promote cooperative learning and teamwork among students. Charlemagne students in grades 3, 4, and 5 are eligible to participate. We hold lunchtime meetings at school from 11:40-noon–dependent on volunteer schedules and gym availability. There are posters in the hallway announcing the next meeting date. There is also an OBOB bulletin board in the hall across from the office. Lunchtime meetings are for general OBOB information, book discussions, and mock battles. Participation in the lunchtime meetings is NOT mandatory. Students are welcome to participate in the school OBOB battles in February provided they have a signed permission slip and are on a team. They are not meant to be the sole preparation for the OBOB battles. It is up to each student to read their 4 books for their team. Many teams choose to meet outside of school and practice on their own. This year Charlemagne is registered with the state and eligible to participate in Regional/State battles. The school battles will follow OBOB structure and guidelines, with official questions from the state. There is so much energy and enthusiasm for reading generated by this contest every year. We want this to be a great year for reading! OBOB at Charlemagne is a parent-run volunteer program. Natalie Reeves and Julie Kim are the co-chairs and can be reached at charlemagneobob@gmail.com. Please contact them if you would like to volunteer during our Friday lunchtime meetings or during battle week, Feb. 19-22, 2019.